It’s really easy to hate this—the O (for Oprah) magazine poetry issue. I mean, Oprah! A huge American symbol of commercial money shallowness–or an inspiration to millions (take your pick). She lives an opulent lifestyle, hosts consumer fests every week on her show (well, maybe not anymore). At the same time, she does some really, really, good things—started a girls’ school in Africa and supports dozens of worthwhile causes with all that empire money. And of course, she named a magazine after herself. How humble is that? But then I heard the April issue of her O magazine was going to focus on poetry, with celebrities talking about their favorite poems and the guest editor role being taken by Maria Shriver, a very accomplished broadcast journalist, but no literary cred to speak of. My first though: This is what I hate about National Poetry Month. My second thought: Well, if anyone is able to make poetry not seem like an affectation done only by depressed Goths, NYC hipsters, adjunct professors and dreamy high school girls, then maybe it’s Oprah. Maybe she can. 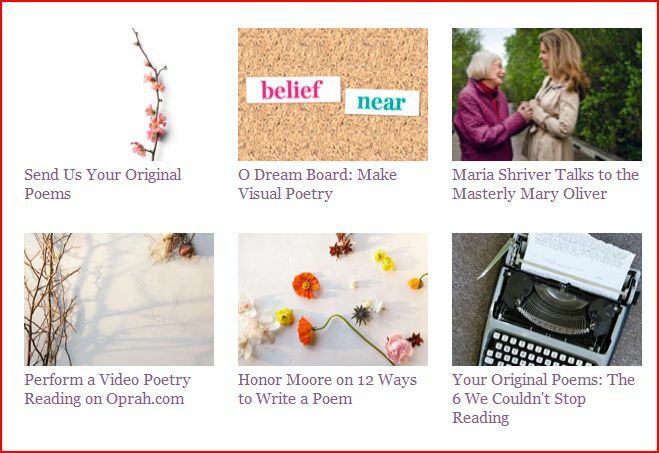 Yes, friends, there’s a link to a page on “How to Write Poetry” with suggestions such as: write down a dream; write down a forbidden thought; write down an aphorism … In fact, there’s a whole section of Oprah’s site called Oprah’s Writing Center. By now my thoughts have turned to: Why can’t she just leave poetry alone? Does the world need Oprah to explain the best sandwiches for a poetry party (apparently it’s po’ boys)? Mike, it’s time to quit. Anyway, he would have been 94 today. Here are readings of a few of his most well-known poems. The last one is a reading performed by my friend and former teacher, Rafey Habib.